Clio Sport 172/182/197/200 Megane 225/230/R26. 8 pcs of Exhaust Inconel Valves. Supertech manufactures a variety of high performance Inconel valves for many applications. These valves are manufactured from a Nickel base super alloy material (Inconel 751 or Nimonic 80A) this material is chosen because it is designed to withstand very high temperatures. These valves feature a one-piece forging, hardened tip, and our superfinish stem. Depending on the application these valves come back cut, undercut, flat or dished. Inconel valves are extremely popular choice for turbos and supercharger applications. Supertech apply more than 30 years of experience in the development of each and every Supertech racing valve we sell. Combine this experience with state of the art equipment such as ultrasonic tests, x-rays, laser measurement equipment, and applications like computerized Finite Element Analysis (FEA) and it is no wonder why supertech has some of the best performance products on the market. While this is more than most manufacturers we dont stop there. We also do extensive testing working very closely with many of today's top engine builders in order to. All of this is meant to insure Supertech's industry leading reputation for high flow rates, durability and uncompromising quality. Our valves are not finished from generic blanks rather they are specifically designed for each and every application. We work relentlessly, testing and researching every aspect trying to improve the air flow of our designs. With every valve design we strive to maximize durability through higher fatigue resistance and tensile strength. Each valve tip is hardened beyond 52HRc. In 2006 we introduced our stem Superfinishing as a standard addition to all of our valves and provided it at no additional cost. When our Superfinish is combined with our Black Nitrided valve it reduces the surface roughness to 1/3 of our chrome coated valve. The end result unsurpassed performance and durability. It's unlikely you will find any of our competitors valves with stricter dimensional tolerances than our Supertech valves. Combine that with finished seats with equally strict run out tolerances and you wont find a better sealing, better performing and easier to install solution anywhere! WE ARE OFFICIAL SUPERTECH DISTRIBUTOR. All our parcels have online tracking. 9:00 - 16:00. 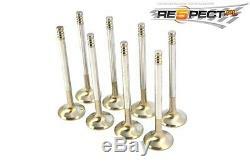 The item "SUPERTECH INCONEL Exhaust VALVES Renault Clio Sport 172 197 Megane Sport 225 230" is in sale since Tuesday, May 10, 2016. This item is in the category "Vehicle Parts & Accessories\Car Tuning & Styling\Engine, Tuning & Chips\Other Engine Tuning". The seller is "kidzio" and is located in Mroków. This item can be shipped worldwide.